My house has aluminum wiring, which from what I understand isn't recommended any more. How do I replace a plug or switch since the new unit only takes copper wiring? Use CO/ALR switches/receptacles: these are specifically designed for aluminum wire. They have "CO/ALR" stamped on them somewhere. When you connect the wire, use a paste like Noalox (box stores sell it). Note that you do the same thing with switches that have wires coming out of them already (like most dimmer switches do) or any other fixtures. Even though not required by the Code, it is recommended that bare ends of solid aluminum conductors be coated with approved joint compound. Aluminum wiring is widely used today for larger commercial and industrial feeders. Electrical distribution companies use it widely throughout their distribution systems including the supply service cable to most residences; in fact it may still be used today for interior wiring systems in residential homes as well as other structures. 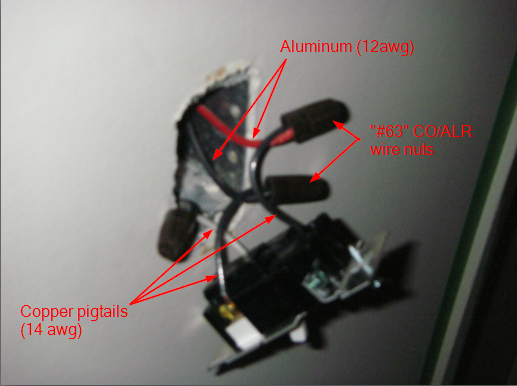 Aluminum wiring itself is safe and if proper connections and terminations are made without damaging the wire and using approved materials installed in accordance with the Ontario Electrical Safety Code and the manufacturer’s instructions, there should be no problems with the aluminum wiring installation. Connect with #63 wire connectors. Use the anti-oxidant paste on the wire and any other connections involving aluminum (apply to the wires before you screw on the connector). Here's what I did in my house, based on internet research and asking my Dad, a construction superintendent. Buy some wire nuts made for multiple types of wire and some anti-corrosion compound (usually available in the same area of the hardware store). Take some copper wire and twist it together with the aluminum wire. Put the compound on the wire and some inside the wire nut. Twist the wire nut onto the wire twist you made. Use the new copper end to connect to the new plug/switch. a set of specific instructions for the number of turns on the copper side/aluminum side. These connectors are quickly becoming accepted by major insurance companies. Their downside is price: approximately $2.00 each, and figure three per outlet if you choose to do the grounds as well. Also they are a bit larger than standard wire nuts adding a bit more difficulty for wire and device room in a existing device box. They appear to be code compliant in most cases for cubic inch capacity. I have installed them in my home and neighbors. The biggest issue with aluminum wiring arc issues are exterior walls that are poorly insulated and major temperature changes occur over the years exaggerating the expansion/contraction issues. Hope this helps. Do not use the Ideal purple wire nuts; I've seen too many melt downs; it's a bad product. Replace the wiring. This is not something that would be safe to do on your own (you really should get a licensed contractor), and looks to cost several thousand dollars (like $8000+ for a 1600 sq ft home). Use AlumiConn. This stuff is actually approved to be used for aluminum to copper connections (the other pigtails mentioned here are NOT), and you can get a free sample to try it out. There's another thing, called COPALUM, but it's not really something you can DIY. Wikipedia has some good information on this. I'll update when I actually get my sample AlumiConn connector to see if it's a viable option. The safest option would be to get a licensed electrician to rewire the house with copper, since the aluminum connections are inherently dangerous (and you will probably find other issues, such as bad breakers, 3-wire 240V instead of 4-wire, and a poorly labeled breaker box like I did). I've had receptacles in my house spark and connections melt because of the aluminum, so please take this seriously. 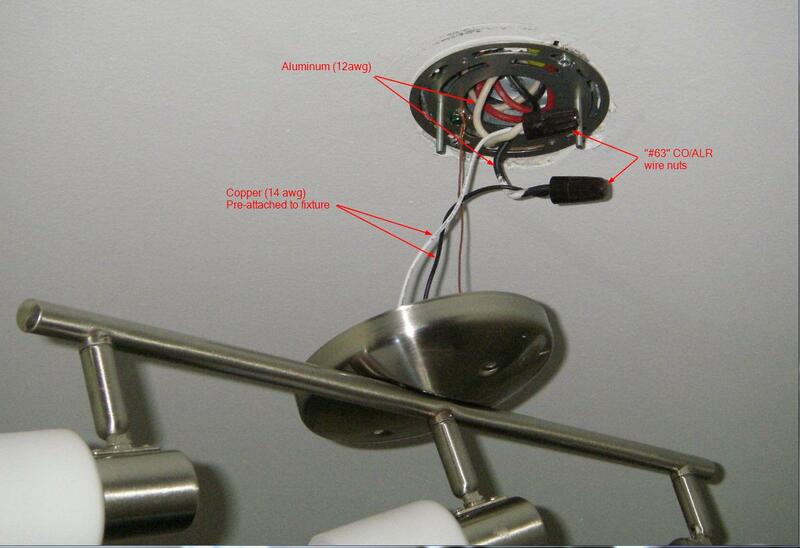 Edit 1: There's also more information about aluminum wiring from the CPSC (PDF) (Consumer Product Safety Commission). My parent's house has aluminum wiring. You can either search for CO-ALR switches and plugs which take aluminum wires or get the paste as you said and wire them together. The paste is important, otherwise the wires corrode and start rubbing/sparking .... bad mojo from there. Just buy the ALR rated outlets and switches. You can pigtail but I don't like that as you now have 2 connections instead of one and you bend the wire more stuffing all that into the box. I have 35 yr old alum wiring. My wiring is in great shape. Replaced several outlets that needed to be replaced. They had the classic alumnimum connection issues. Connected properly there is no problem with aluminum wire. I remember when it came out the industry was publishing all sorts of propaganda to sell ALR as the next big thing. Popular mechanics did a big piece saying we'd never use copper again. Now they are selling $50 "special" cold weld connectors. Its all a big friggin joke and a $ machine. A good connection will remain in place for decades no matter how many hot/cold cycles it goes thru. A bad connection may very well have problems. /The aluminum to copper splice connector that I use is the AlumiConn 95104 which fits wire from #18 to #10. Remember that aluminum wire is larger than copper for the same capacity current. These connectors are available at Lowes for about $6.50 for a package of 2. First, fit an AFCI breaker on the circuit. Then, fot CO/ALR receptacles and switches where you are concerned. The keystone is the Arc Fault Circuit Interrupter breaker. I cannot see a way to feel safe without it. You hear about melted receptacles and other problems, that is caused by arcing and that is what AFCI breakers trip on. When an AFCI trips, that circuit has just started the arcing that would melt receptacles and start fires. At that point, you move through the circuit, cleaning up all the wire ends and fitting CO/ALR devices and safe splices. I don't trust any "magic" wire nuts which let you splice copper to aluminum. Dissimilar metals cannot work in a wirenut. What works is Alumiconns, as they are miniature versions of the lugs on your main panel, which work fine with both aluminum and copper. To my knowledge, this insulated 3 port splice connector is the safest product on the market right now. Unfortunately, I don't know who actually makes it or what it's called- just what it looks like. NSi Industries (Tork) makes something similar (their IPL series), but I'm not sure if they make really small ones like you need. My niece has the same problem with whole house wired in aluminum. The reason I know is she asked me to checkout a sparking receptacle in her game room. I ended up finding three receptacles burned to a crisp and needing repair. After trying to find which direction to use for repairs on the internet, it seems like the alumiconn connector is my best choice (other than rewiring, or that crimp method that pros use). Not the answer you're looking for? Browse other questions tagged electrical aluminum-wiring or ask your own question. Should I have a 15 amp breaker instead of a 20 due to aluminum wire? Is there aluminum wiring in my vent fan? Best way to splice together 20/22 gauge wiring? Receptacle connection with aluminum wiring? Leads from wall fan control switch are aluminum wire?